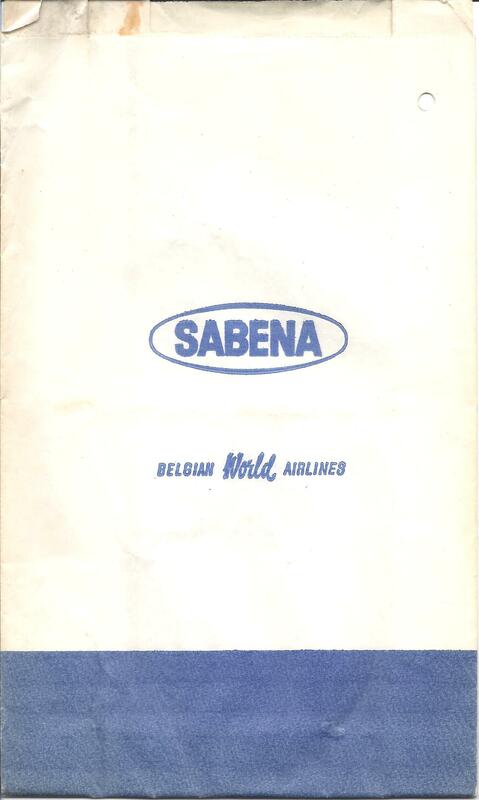 This is almost identical to the other old Sabena bags with the oval logo, except this bag was manufactured by ACS as you can tell if you look inside the fold. 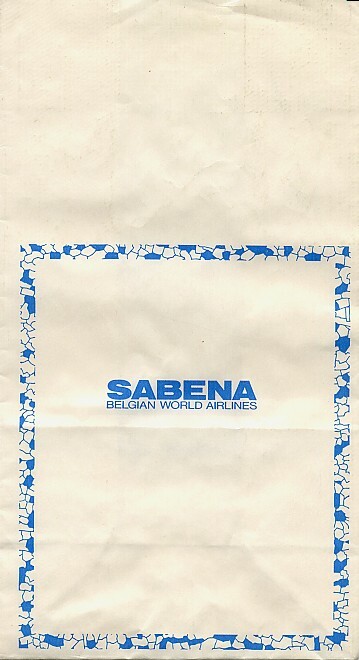 Sabena bag designers make egregious error in not covering the entire bag with the under-utilized mosaic design. 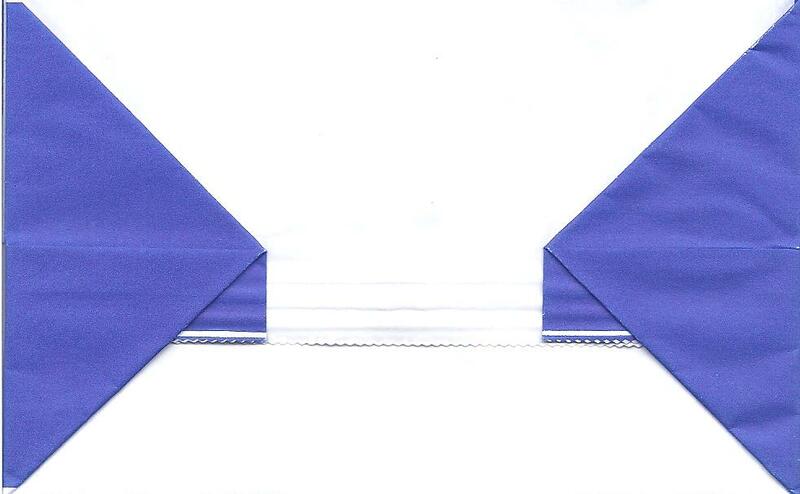 It might make the bag beautiful in a map of all counties kind of way. 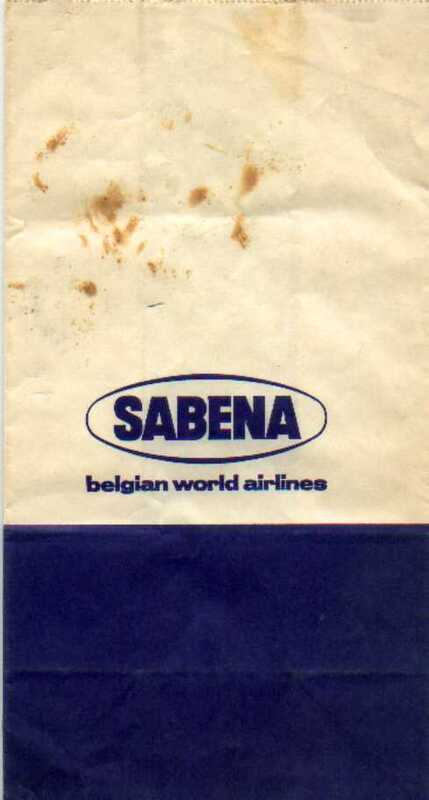 Sabena goes minimalist. They changed the logo to either look like a gray verison of the old Coca-Cola logo or something that Bill Amend (Foxtrot) drew on a soda can. Belgians demonstrate that although they aren't original, they sure know how to copy Swiss design. 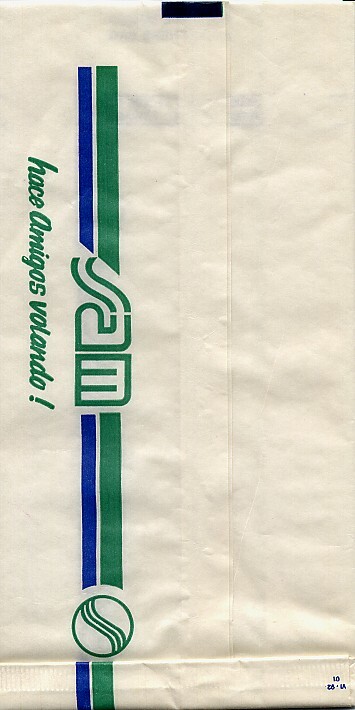 Almost identical to an earlier version of this bag, except the S logo is now a superscript, instead of a regular character. 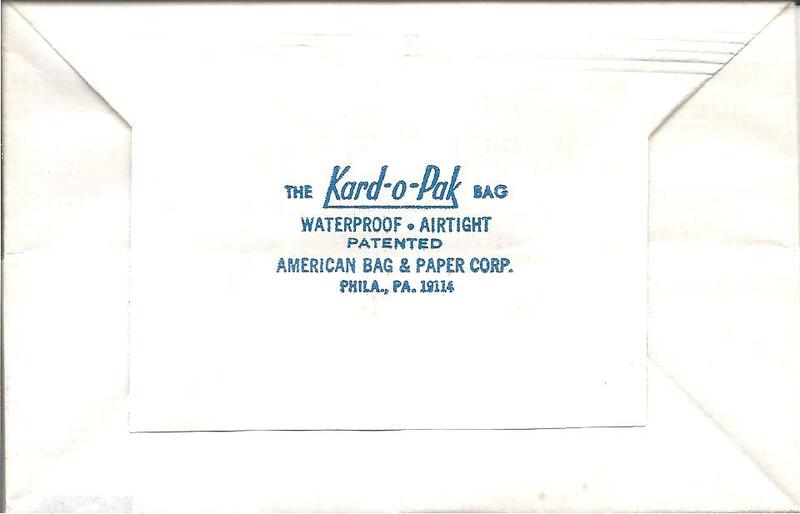 This bag harkens back to a time when logos were as simple as the company name with an oval around it -- kind of like DuPont. 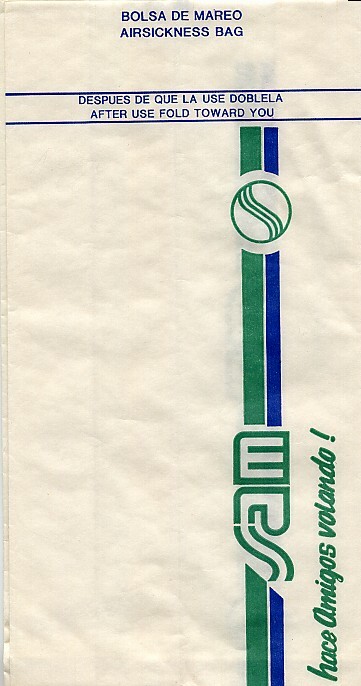 Bag also has a nifty old ELAG logo on the bottom which seems to warn "No Barfing". 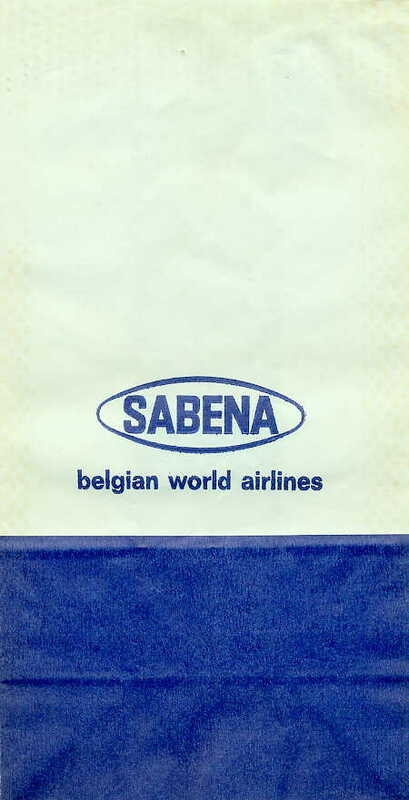 This is almost identical to the other old Sabena bag with the oval logo, except there is no printing on the bottom, i.e. 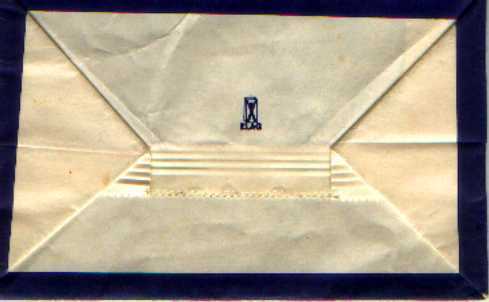 it is NOT from ELAG like the other one. 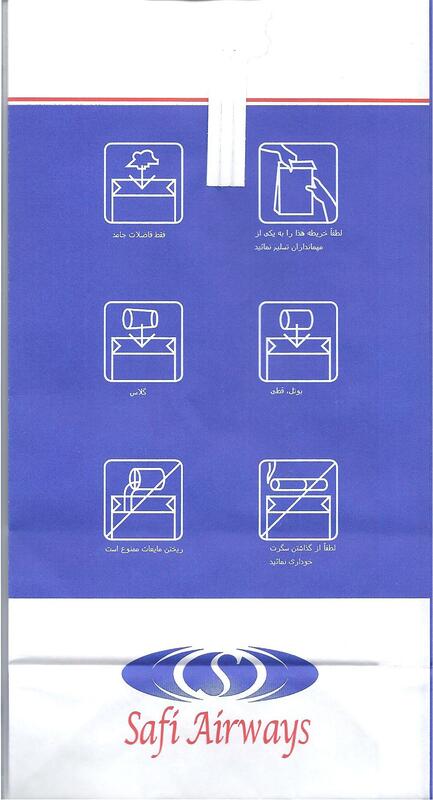 They emphasize World by printing it in cursive. 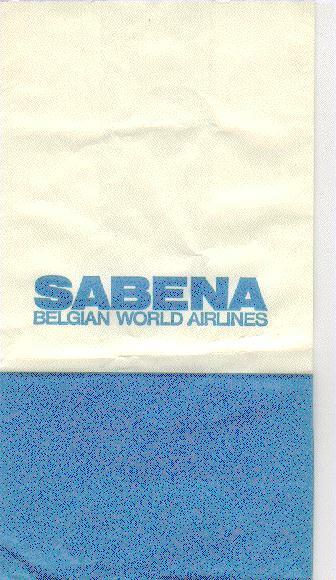 This bag is the paper airplane version of Sabena, featuring a paper airplane flying parallel to ocean waves, of which there's very few in Belgium. FLASH! Mermaid expert and amateur Belgian cartographer Veerle van Mansfeld is quick to correct my erroneous assertion. 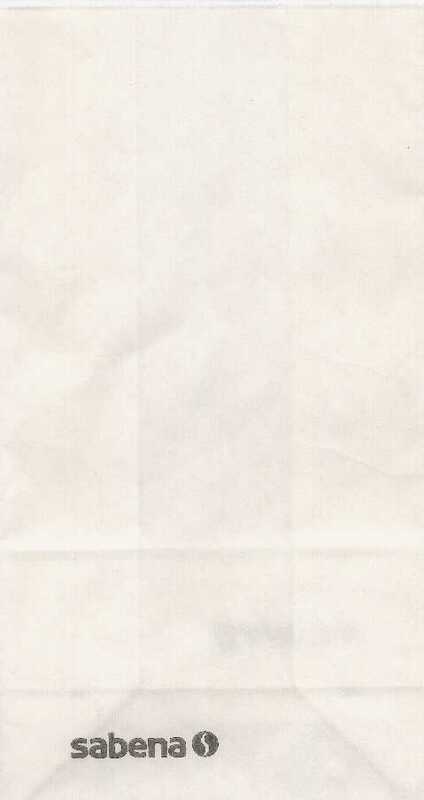 Veerle says, "Belgium is a tiny, tiny, TINY country. 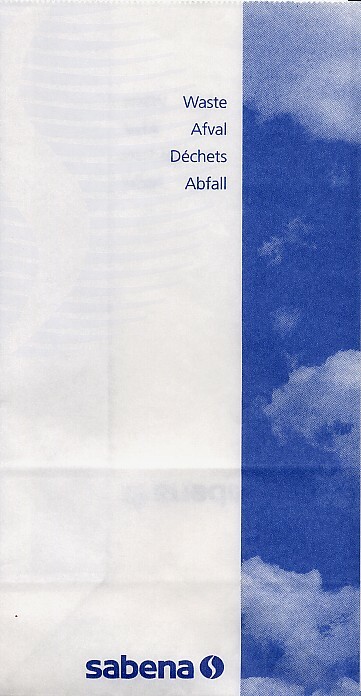 From the uppermost North to the downmost South is only 193 km (120 miles) BUT our coastline (Atlantic Ocean/North Sea) is still 67 km (42 miles) long, so to us Belgians, a plane and its barfbags flying over ocean waves, are a very common image. I am just - in an absurdly perfectionist way - setting the record straight." 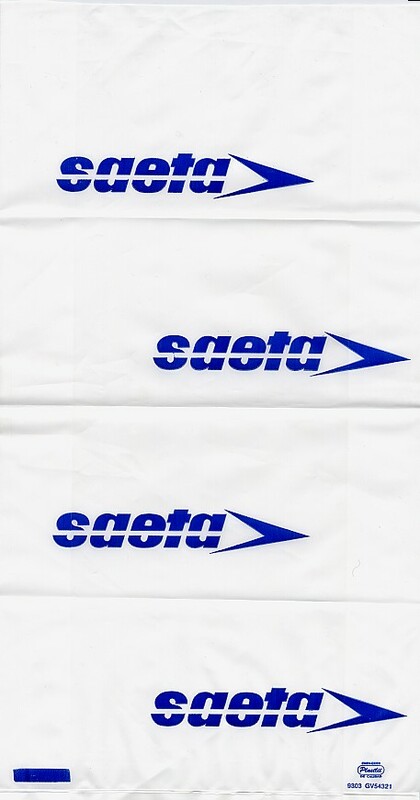 A British bag appropriates the Safeway logo and adds the biohazardous waste text without the universal logo for it. 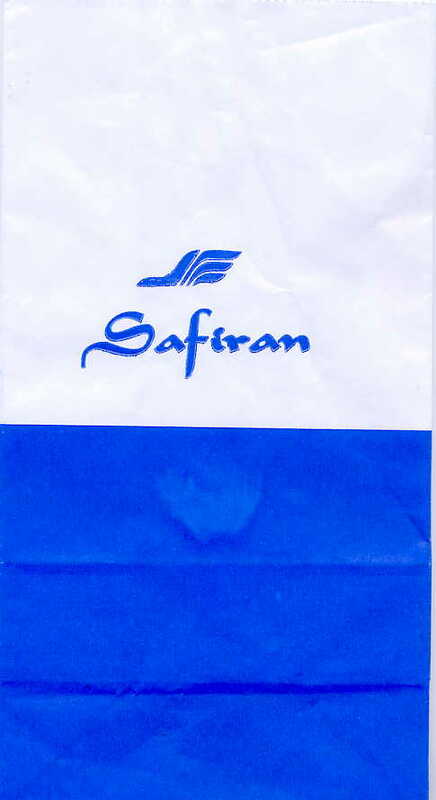 Uh-oh, somebody needs a new inkjet cartridge, the one used on this bag is on the blink. 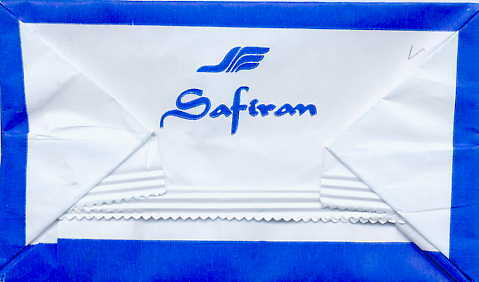 I don't know if Safiran means anything in Farsi, but a more Anglo friendly airline name would be Safe Iran. It looks like you're supposed to take a coin and rub off the spot on the lower left, hoping you'll expose a $1,000,000 prize, but probably exposing 10% off of your purchase price. 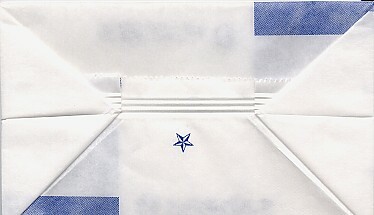 Bag features 3 arrows pointing in different directions. 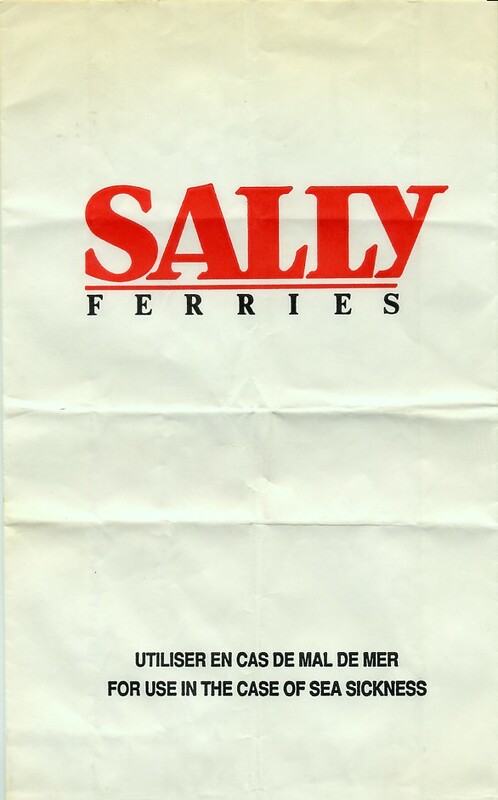 This Honduran airline was more popularly known as "Stay at Home, Stay Alive"
Looks a little bit like 'Salty Ferries'. 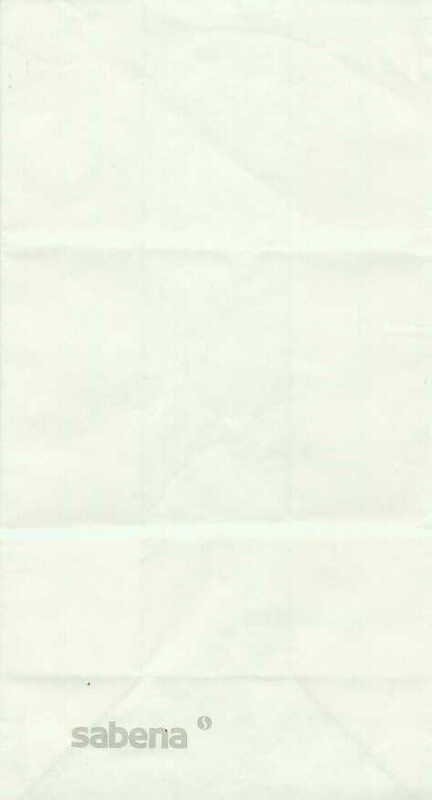 I got this in a swap for a CD. A much simpler, toned town Sam, as though this bag belongs to some guy named Sam. 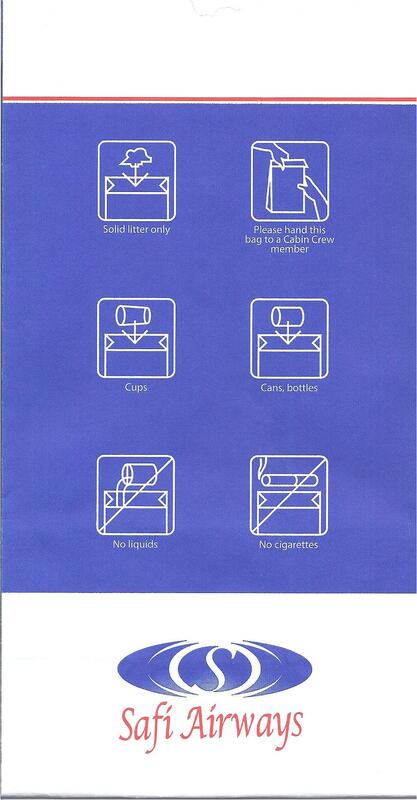 Although Sam is an odd name for an Airline (like 'Bob' might be), perhaps I've fallen into the bag orientation trap. 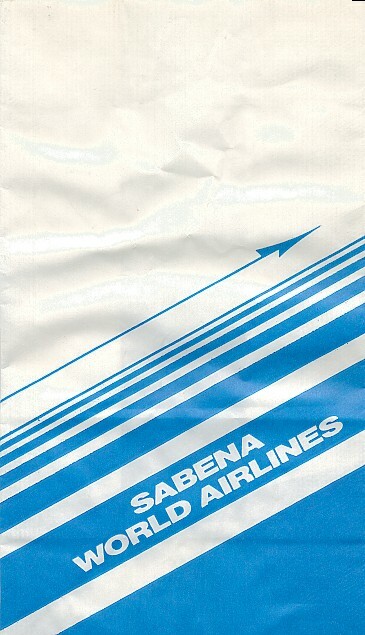 I assume Side 1, that way it's scanned in, is sideways, but if it's not, this could easily pass for "E Drainpipe Airlines". 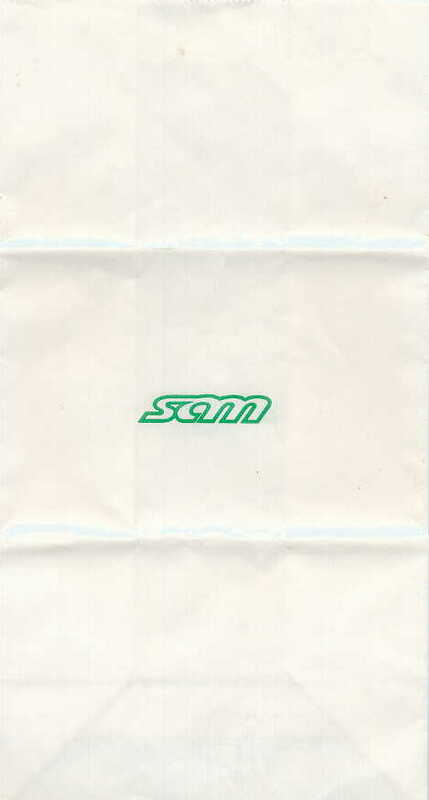 Sam is oddly reminiscent of UniSAM, discussed in more detail in the waning pages of "Cvltvre Made Stvpid (Culture Made Stupid)" by Tom Weller. 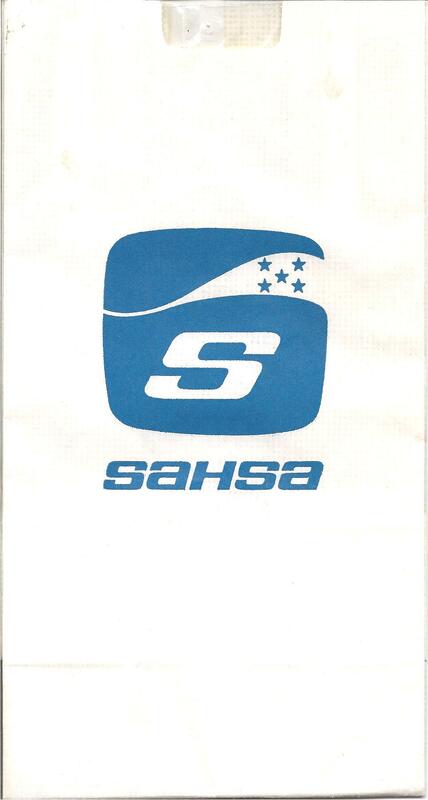 Or maybe the logo is a Yin/Yang thing? 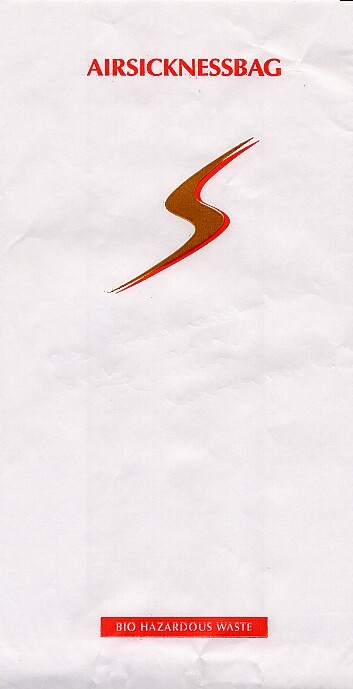 Or a Safeway logo?